Fátima is a world famous city in the historic province of Beira Litoral in Portugal. Fátima is a world famous place of Christian pilgrimage in commemoration of the apparitions of the Virgin Mary reported by three little shepherds – Lúcia, Francisco and Jacinta – from May 13 until October 13 of 1917. The Catholic Church later recognized these events as "worthy of belief". A small chapel, now known as the Chapel of the Apparitions, was built at the site of the supernatural events, and a precious statue of Our Lady of Fátima installed. Due to the Sanctuary of Our Lady of Fátima, a Marian shrine complex containing two minor basilicas in Cova da Iria, the city has become in one of the most important international destinations for religious tourism, receiving between 6 and 8 million pilgrims by year. It attracts religious people and also those who seek the kind of peaceful lifestyle usually only found in convents and monasteries. There are Rede Expressos buses to and from Lisbon's central bus station in Sete Rios every hour between approximately 7AM and 7:30PM. A round trip costs €25 and takes 90 minutes each way. From Fátima bus station, it is a short walk of a few hundred metres along the streets with shops and hotels to the Sanctuary (the Marian Shrine). Do not catch a train to the misleadingly-named Fátima station, as this is over 20 km by road from the city. It is a short walk from the bus station to the basilicas and the Chapel of the Apparitions. It is also possible to walk to the Way of the Cross in Valinhos and to the Aljustrel village, the birthplace of the children who claimed to see the apparition. Within the city there is an electric mini train. The Sanctuary of Our Lady of Fatima in Cova da Iria. The Sanctuary of Fatima, also known as Sanctuary of Our Lady of Fatima, is a group of religious buildings and structures in Cova da Iria, a place in the civil parish (freguesia) of Fatima. In addition to the Basilica of Our Lady of the Rosary, the sanctuary comprises the Chapel of the Lausperene, a great oak tree (near which the famous Marian apparitions occurred), a monument to the Sacred Heart of Jesus and the Chapel of the Apparitions, where three children Lúcia Santos and her cousins, Jacinta and Francisco Marto, were first visited by Virgin Mary. In addition, several other structures and monuments were built in the intervening years to commemorate the events associated with the events in 1916, including: the Hostel/Retreat House of Our Lady of Sorrows, the Rectory, the Hostel/Retreat House of Our Lady of Mount Carmel, a segment of the Berlin Wall, monuments to Fathers Formigão and Fischer, a High Cross (by artist Robert Schad), and individual monuments to recent popes. Across from the main sanctuary is the much larger Basilica of the Holy Trinity constructed after 1953, owing to the limited scale of the Sanctuary for large-scale pilgrimages and religious services. 39.63224978-8.671885371 Basilica of Our Lady of the Rosary (Basílica de Nossa Senhora do Rosário de Fátima). Contains the tombs of two of the little shepherds Francisco and Jacinta Marto (who died in 1919-1920), as well as the tomb of Sister Lucia (who died in 2005). 39.63163006-8.67323722 Chapel of the Apparitions (Capelinha das Aparições). This is a small chapel located in Cova da Iria that was constructed in the 1920s to mark the exact location where three little shepherd children reported having received the famous apparitions of the Virgin Mary. Here you can see a diamond-encrusted gold crown of the Virgin Mary's original image, which contains the bullet that was removed from Pope John Paul II after a failed assassination attempt. 39.62958495-8.675345423 Basilica of the Most Holy Trinity (Basílica da Santíssima Trindade). This is the newest Roman Catholic church and minor basilica in the Sanctuary of Fátima. It includes the chapels of reconciliation (confessions). 39.632062-8.677385 Wax Museum of Fátima (Museu de Cera de Fátima). It depicts the whole history of Fátima in 31 scenes with 112 wax figures duly set in the décor and ethnography of the apparitions’ period that took place in the year 1917. 39.625537-8.6659336 Monument of the Three Little Shepherds (Monumento aos Três Pastorinhos). 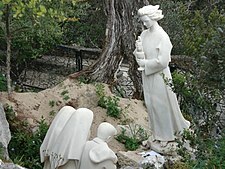 Statues dedicated to the three little shepherds of Fátima. 39.62497808-8.667325627 Way of the Cross and the Hungarian Calvary in Valinhos (Via-Sacra e Calvário Húngaro dos Valinhos). The Stations of the Cross and the Hungarian Calvary are an obligatory visit for all pilgrims to Fatima. 39.61634322-8.670257548 Monument of Our Lady and of the Angel of Peace in Valinhos (Monumento a Nossa Senhora e ao Anjo da Paz nos Valinhos). The statue dedicated to the apparition. There is also a statue of the Angel of Peace, who also made an alleged appearance in 1916. 39.61553422-8.664896619 Houses of the Three Little Shepherds in Aljustrel (Casas dos Três Pastorinhos em Aljustrel) (In Aljustrel village). Visit the late 19th century family homes of the three witnesses to the Apparation: the house of Lucia dos Santos and the house of Francisco and Jacinta Marto. 39.61792273-8.6526308710 Parish Church of Fatima (Igreja Paroquial de Fátima). Where the three shepherd children were baptised. 39.605548-8.62600611 Sanctuary of Our Lady of Ortiga (Santuário de Nossa Senhora da Ortiga). Marian shrine that memorializes an old apparition of the Virgin Mary to a little shepherd girl. Pope Pius VII granted a special indulgence to pilgrims who visit with religious piety this important Catholic temple. For Catholics visiting Fátima as a pilgrimage, there are several masses daily at the basilicas and at the Chapel of the Apparitions. Do a tour to the places surrounding the Sanctuary of Fátima or even to the medieval Castle of Ourém, where you can drink "Ginjinha", the special morello cherry liqueur. 39.625282-8.666711 Fátima Guided Tours (Visitas guiadas a Fátima), e-mail: info@fatimatourism.com. Walking tours for a nominal fee in the city and to the surrounding places related to the Angel of Peace and Virgin Mary apparitions. They also distribute free materials that you can pick up without going on a tour: maps, prayer cards, etc. The street between the bus station and the church are lined with shops that sell church-related items (rosaries, statues of the Virgin Mary, etc). The Basilica itself has a shop as well. Some items of note are rosaries with a little bit of earth from Fátima (€3-€4.50). With several masses each day at the Basilica and at the Chapel, there shouldn't be a problem finding a priest to bless the rosaries after you purchase them. Do not forget to taste the pastries of Fátima (Pastéis de Fátima). 39.618019-8.653091 Tia Alice, Avenida Irmã Lúcia de Jesus, 152, 2495-557, ☎ +351 249 531 737. 12h00–15h00 / 19h30–21h00. Rustic-chic environment with great traditional portuguese food. 39.624608-8.6655952 A Cave, Avenida dos Pastorinhos, 895, 2495-408, ☎ +351 249 153 159. 11h30–14h30 / 19h00–22h00. Restaurant with great traditional Portuguese food. 39.618673-8.6621093 O Alentejano, Avenida dos Pastorinhos, 795, 2495-408, ☎ +351 249 151 740. 10h00–23h00. Restaurant with food from the Alentejo region. 39.627373-8.6669384 Taberna do Bacalhau, Rua Francisco Marto, 28, 2495-448, ☎ +351 249 538 420. 12h00–15h00 / 19h00-22h00. Restaurant specialized in cod dishes. 39.60561-8.6569435 A Fandanguita, Avenida dos Pastorinhos, 635, 2495-408, ☎ +351 249 531 024. 12h00–22h30. Restaurant with traditional Portuguese food. 39.61597846-8.663928331 "Anta" Bar, Rua dos Pastorinhos, 70, Aljustrel, 2495-301. Terrace bar with background music. 39.61242847-8.666547782 "I Love Beer" Collection Bar, Rua do Biqueiral 67, 2495-350. Great bar with music and several collections. Fátima is a city of hotels and guesthouses, so it's not difficult to find a place to sleep. Budget accommodation with breakfast starts at €30 for a twin room. If you want to book in advance via hotel booking web sites, the time for best prices is approximately one to two weeks before your stay. 39.624350361346-8.66543412208561 Fátima Lounge Guesthouse, Avenida dos Pastorinhos, 887, Cova da Iria, 2495-408 (next to the Valinhos), ☎ +351 249 532 275, e-mail: fatimalounge@gmail.com. This lounge residence allow guests to cook their own meals and feel as if they were in their own home. 39.626676582807-8.66582036018372 Pastors Park, Rua da Lagoa, 28, Cova da Iria, 2495-421. Private apartments decorated to a high standard and with all the amenities of a modern home, such as up-market bathrooms, bedrooms and fully equipped kitchens. 39.621614988472-8.67713928222663 Luz Houses, Rua Principal, 78, Moimento, 2495-650, ☎ +351 249 403 911, e-mail: info@luzhouses.pt. Accommodation in a rural setting. 39.57495652399-8.62239003181464 "O Casal" House, Estrada Coelho Prazeres, 49, Casal Farto, 2495, ☎ +351 249 521 562, e-mail: casa.ocasal@gmail.com. Residence of rural tourism with historical chapel. Batalha — near Fátima is located the beautiful Monastery of Saint Mary of the Victory of the Battle. Ourém — the city's beautiful castle and regional liqueur (Ginjinha) are musts for any visitor. Tomar — the city of the Knights Templar: it is highly recommended to visit the medieval castle and the Convent of Christ. Nazaré — a lovely village that became an international surf spot and entered into the Guinness World Records for its gigantic sea waves. This city travel guide to Fátima is a usable article. It has information on how to get there and on restaurants and hotels. An adventurous person could use this article, but please feel free to improve it by editing the page.